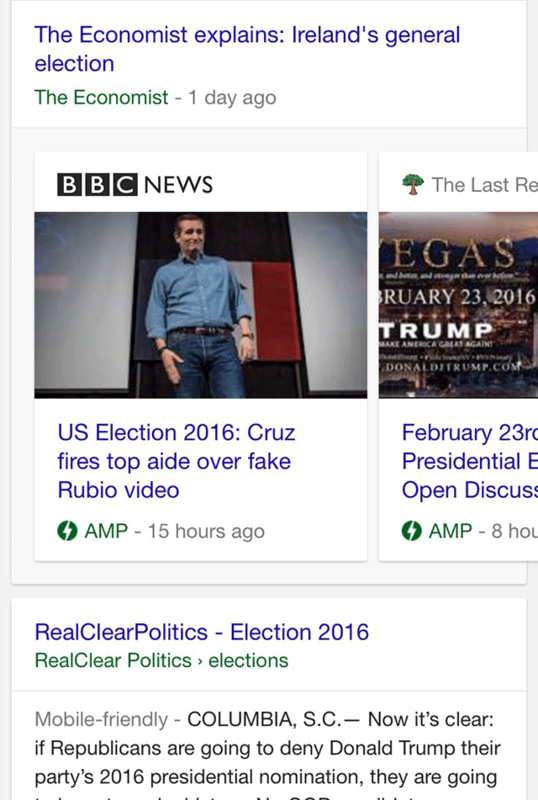 Google has made the accelerated mobile pages live in the mobile search results. AMP is a shortened form of HTML that speeds up the site loading time. How Does it Look Like in the Mobile Search Results? 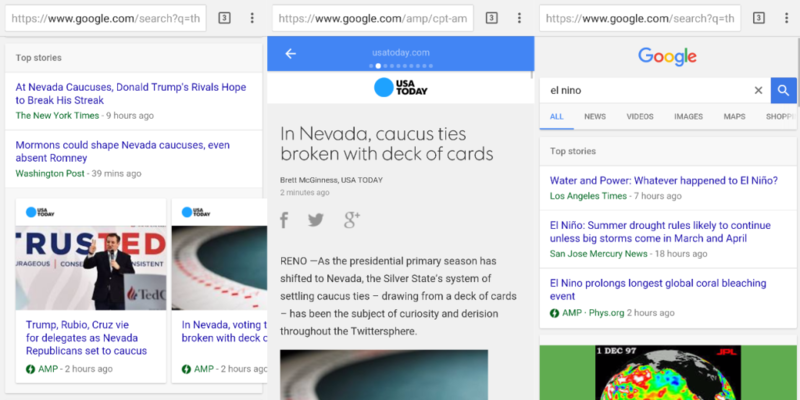 Here are some screenshots as to what AMP pages look like in the Mobile search results of Google. Does AMP Pages Boost Search Rankings? AMP pages receive a boost in search rankings as faster loading time optimises the overall user experience. For Google, user experience is on the prime priority and websites that cares for the user receives a boost in rankings. In the wake of the Mobilegeddon update which provides a boost to mobile friendly pages in the search results, the addition of AMP is another factor that will streghthen the impact of mobile friendly algorithm. Google's John Mueller says, "If there's no official announcement, then I'd assume it's not officially rolled out yet :). Sometimes we do incremental roll-outs, ramping things up slowly to make sure that things work as expected. ﻿"
How to Produce Content That Starts to Generate Backlinks Almost Instantly! Well, why not? Link building has long been one of the toughest tasks in SEO and digital marketing. For someone like me who has spent around 8+ years in SEO; link building (or rather link earning) has remained and still continues to be the most challenging. Research suggests that content marketing is on a boom with 85% of online marketers directly involved with content marketing. Companies are hitting nail on their head to produce all sorts of content but the success ratio in terms of getting backlinks or exposure from their content is still low. As per the recent survey conducted by Moz and Buzzsumo, around 757,000 articles were analyzed for their effectiveness to be served as link baits and the results were shocking. Around 50% of the posts had zero external links. The survey also suggested that there is no correlation between social shares and links. “CONTENT SHOCK” - You Are Producing Content But It’s Of No Use! Believe it! Majority of the companies are generating content that’s all CRAP. It is hard to digest but content that fails to drive shares or attention from the readers is nothing but crap. Backlinks - The Gold of SEO - How Deep Can You Dig? The most difficult content to produce is the one that generates backlinks. In fact, the more effort you put into producing quality and purposeful content, the better results it can produce in the long run. We are all living in the age of modern digital marketing where link building ROI is important as it signifies whether your marketing efforts are working or not. Today, I will share with you a step by step guide to produce content that is able to generate backlinks almost instantly. The below steps defines exactly how you need to proceed in order to generate content that gets backlinks. The Moz survey revealed that long form content consistently received higher backlinks. Content pieces that were between 3,000 - 10,000 words long received the maximum links. The study proved that there is a direct correlation between content length and links. Hence, if you are looking to generate backlinks from your content then keep it in the range of 2000 -3000 words. The Headline is the most neglected part of your article. As per the study published in Quicksprout 8 out of 10 people will read headline copy but only 2 out of 10 people will read the rest. If the title of the post is not good, you are actually losing 80% of potential link prospects. Having a creative and engaging title that persuades the audience to open it up and read the entire piece is not that difficult. 1- Keep the headlines between 5-7 words. 2- Use numbers. Sometimes obscure number like 13 or 39 can catch the attention of the reader. 3- Make use of the words "what", "why", "how", or "when". 4- Use negative words like "No", "Without" and "Stop". 5- Try the formula (Number of trigger word + Adjective + Keyword + Promise) to create really awesome titles. For example , the title "Why You Should Buy an iPhone" can be changed to "7 Valid Reasons to Ditch Your Old Phone and Get a New iPhone". The Coschedule Headline Analyzer - It provides a score to your overall headline quality and rates its ability to result in social shares, increased traffic and SEO value. The best part of this tool is that it provides an emotional score to judge the overall effectiveness of your title. Portent Content Idea Generator - Just enter the subject of your content and it will provide a set of ideas to get you started. TweakYourBiz Title Generator - It provides a list of titles based on nouns, verbs, lists, questions, HOW to, secrets etc. If you are looking for lots of readymade ideas to choose from then this is the tool you should use. Content Row Link Bait Title Generator - Simple enter the topic and this tool will provide you some really cool link bait title ideas. List based and How to styled posts are the ones that receive the maximum backlinks. Similarly, a search for "Pets" on the Ahrefs content explorer reveals most of the posts are list based and have numbers in them. This clearly explains the reason why you should get your next post list based (have numbers in them) in order to generate backlinks. 4- Implement the "Skyscraper Technique"
The Skyscraper technique if implemented properly can make your link count climb up like a rocket! 1. Find content that’s performed well in your industry. Use the Ahrefs content explorer tool. Just enter your main industry keyword in the search bar and click on search. Ahrefs will automatically find the most shared and most linked to content based on that topic. Moreover, you can refine your search by filtering the results by date, domain name or language. Is the information provided simple and easy to read? Are you providing an innovative way to browse and find products that you are selling? Is your site speed good? Are your pages mobile friendly? Are you having original photos and descriptions? Is the information clear and accurate? C- Credible: Always use original research, citations, links, reviews and testimonials. Original testimonials from real customers can help boost your site’s trustworthiness and reputation. D- High quality: Is your content focussed on giving visitors a good user experience and not just to rank well in search engines. E- Engaging: Update your content regularly like Wikipedia does. Avoid 7 mistakes of content writing and prepare content that is truly engaging. Do not provide incorrect information or have grammar errors. Do not distract your audiences by displaying too many ads. Engage visitors by including comment boxes and social media widgets. Once you have the piece ready then promote it spam-free on every possible website on the web. More information on how you can amplify the reach of your content is mentioned later in this article. Visitors spend 88% more time on a website that includes video. Moreover, 3x as many monthly visitors are added to a website having video content. If the visitors spend more time then this directly means that the chances of linking are more. 1- Prepare content that your audience will love to watch. Focus in on your target demographic and make it informative, entertaining and succinct. 2- Align your video content with your brand goals. 3- Videos allows you to be more creative. Make sure to "tell a story" to drive high levels of user engagement. 4- Make it easy for users to share your videos. 5- Measure the ROI from videos. Analyze and understand. For instance, have a look at this video by CNN that has more than 50 linking root domains.This is what typically an eye grabbing video should be. Similarly, health.com has an amazing link bait video about "work your abs without crunches" that has around 47 domains linking to it. For E-commerce sites, product videos can be a great link bait. Users are most willing to share videos that are sharing the steps telling them exactly how to use a product. Product pages which are one of the most hard to link content can eventually raise its chances of getting linked to simply by adding videos in them. Brian Dean is an awesome guy who built a method of building backlinks through a technique called guestographics. You can also create content and amplify it with the help of guestographic technique in order to generate backlinks. Step 1: Post an infographic on your site based on freshly relevant topic. You can make use of Google trends to find topics that is relevant to your purpose. As for example, I am a food site owner who wants to prepare an infographic based on any sweet food. Obviously, the search query should be such that is getting popular. I will quickly prepare an infographic based on this topic. You can easily find relevant sites by doing a Google search like "sweet potato pie", "sweet foods", "sweet food recipes" etc. You can also make use of the Ahrefs content explorer to find sites where this sort of content is gaining popularity. Recently, I tried this one (recipe link here) myself and received a lot of compliments. Since then my experiments with food started and last friday I prepared the very special "Sweet potato pie" recipe. You won't believe this but I had prepared this dish 3 times in the last week alone because it was way too delicious. I thought of sharing this recipe with fellow sweet tooth loving people and prepared an infographic on this. The infographic visually explains how to prepare the recipe in an easy way. Let me know if you want to check it out! Also, let me know if you need a short piece of content along with this infographic. I would be happy to write this for you. That's all! Write a post and link back to your site in any relevant manner you wish to, send the post to the interested recipients and you will get a contextual backlink in return. The strategy is absolutely simple. Before creating any content, find out authoritative websites that have broken links. First of all, install a Chrome plugin called Checkmylinks. Now, find out potential websites by a simple search query like : "Free Softwares" inurl:links or "Free Softwares" inurl:resources. Just click on the Checkmylinks icon displayed on the browser and this will highlight any broken links that it finds on the page. Identify opportunity where you can create an interesting piece that can easily replace the broken link. Email the webmaster and notify about the problem. Nobody likes 404 pages, and it’s also considered an SEO problem to link to pages that don’t exist. In the email approach, suggest the webmaster to replace the broken link with your website. That was easy, isn't it? Nobody likes to read content that have long paragraphs. A- Break long para into short sentences. Make predictable, scannable pages to improve readability. B- The content should serve like an inverted pyramid where the conclusion is presented first. Obviously some suspense should be kept for the end but the crux is to generate curiosity. C- Add Compelling headings and subheadings. This technique works like a charm and readers will be spending more time on your site. Producing content that caters to the needs of your users and has the 10 essential factors mentioned in the table above, you can increase your chances of getting backlinks. You have produced a great content but it is still only half done. Unless, you take pains in amplifying it and reaching out to influencers you are not going to gain backlinks. An influencer is a content amplifier. He/She should drive an action. Platforms like Twitter and LinkedIn as well as use PR sources such as HARO and Cision are great to find influencers. 1- Define your target audience and derive KPI's. 2- Find the right influencers using tools such as BuzzSumo, Traackr, Klout, PeerIndex, Twitonomy etc. 3- Monitor their activity on social networks and find out the content that they share and like the most. 4- Reach out to them personally using email marketing software like GetResponse that offers easy to use A/B testing features that will help you to find which of your mails works best with your influencers. 4 content pieces should be shared with your influencer group that do not belong to you. 1 shared piece should be original, educational content that you have created. 1 piece should be completely sales oriented like discount coupons or daily deal that is less likely to get noticed. 6- Participate in conferences and webinars where they regularly take part and connect with them. Tools like Clickmeeting are really effective in promoting your brand in the eyes of influencers because of its really useful meeting room rebranding features where you can customize the design and leave a lasting impression in the minds of the influencers. That's all folks! Hope you enjoyed this post. As a roundup of things, if you really need to increase the flow of backlinks to your site then make sure to have content over 2K words, have a great title, use relevant images and videos, reach out to influencers to amplify the published content. Awesome! Now, sit back, relax and see the links growing.